In this episode, Ricardo talks directly from the Zaatari refugee camp located in Jordan, where he is participating in the recordings of the documentary: "Zaatari: The Desert that Became Home" (in a free translation). Zaatari is the largest camp of Syria War refugees, and, in just four years, it became the third city in the country. Learn more about the documentary. In this episode, Ricardo explains the differences between project and production/operations management, giving characteristics and examples of both areas. What is the difference between managing a risk and managing an issue? In this episode, Ricardo explains something that many people still confuse, are risks and problems the same things? He also gives tips on how to manage problems, small or large ones, effectively. 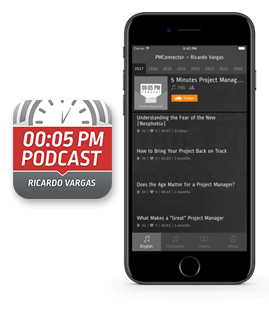 In this episode, Ricardo explains the differences between the role of an engineer and of a project manager. He tries to answer once and for all the doubts that many people have to understand these two roles in a project environment. In this episode, Ricardo talks about why statistics is of great importance to the project manager and recommends a free online course at Udacity: “Intro to Statistics” by Sebastian Thrun. Why You Must Be Proud of What You Do?